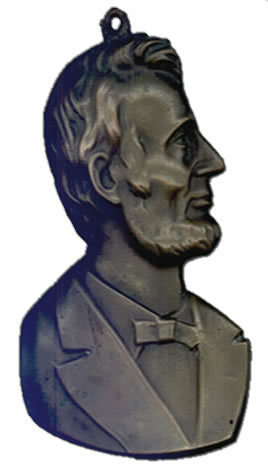 Abraham Lincoln Brass Plaque Bust. February 12, 1809: Birthdays in "Human History"
Yes, February 12, 1809. Charles Darwin was born the same day that in an isolated hamlet in Hardin County, Kentucky, Nancy Hanks Lincoln presented her husband, Thomas, with a second child, a son who would be named Abraham. There are many coincidences in history, but I must say I was struck by this one—to think that on this single day, two individuals were born who would profoundly affect the course of human events in ways that are still very much with us. For these two individuals would change how we think about ourselves and the world, and they would both be remembered as towering figures of singular, even revolutionary, importance even though, in their own lifetimes, both were shattered by personal loss and were vilified for what would become their life's work. Lincoln and Darwin: The one sought to preserve an experiment in self-government and establish that slavery was incompatible with democracy. The other, a scientist, advanced a theory of natural selection and evolutionary change that would dramatically alter our understanding of the basic biological processes of life itself. Lincoln and Darwin are remembered today for moving us to new places, to new understanding, and, each in his own way, for working to set people free. It is in the history of freedom, even more than in the history of government or the history of science, that these two individuals made contributions that still inspire us to take note of their achievements, and even to reflect on what turns out to be an extraordinary "birth day" in human history.